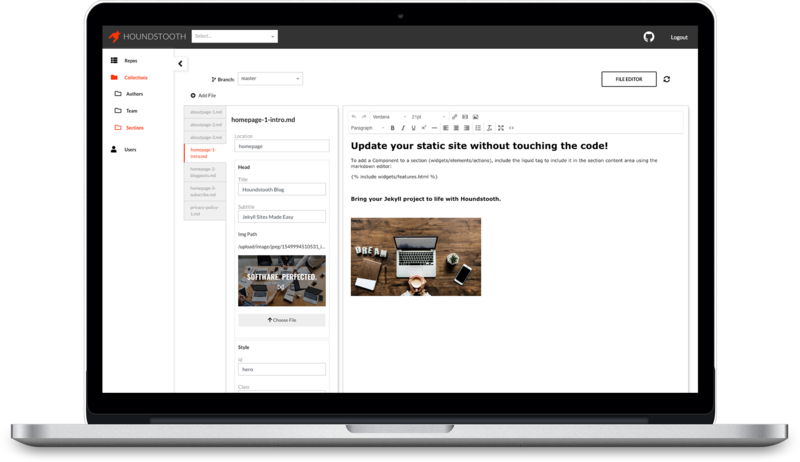 Houndstooth gives content editors a simple interface to publish changes to static sites hosted on Github. Houndstooth uses the GitHub API to connect directly to your project so content editors can commit changes without a local editor. Houndstooth exposes Jekyll collection content in a customizable UI, defined by the web developer. Our File Editor allows you to edit any code in your repo, then stage and commit changes to GitHub. Anyone who wants an easy CMS for their Jekyll website. Developers who want to provide their clients with an easy way to manage their site. Agencies who use Jekyll or similar static site generators. Marketers who want to be able to easily edit Jekyll site content. Anyone looking for a web based editor to modify content in their GitHub repositories.